Dr. Wassef is specialized in General and addiction psychiatry, skilled double board-certified psychiatrist, particularly interested in TMS therapy new technology, the mind-body connection non pharmacological management for psychiatric and addiction Disorders and utilizing a creative and cooperative pathway to wellness. While providing an expert opinion, Dr. Wassef very much is interested in working together with you. So, in a caring fashion, a careful assessment of your symptoms is conducted, including a full medical history, to then devise a treatment plan.Dr. Wassef is available either as a sole provider for mental health issues or as a compliment to your already existing psychotherapy or counseling. Special areas of experience and interest are Depression, anxiety, PTSD, Alcohol and drug addiction, relationships, and stress management. 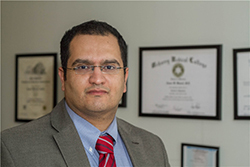 Dr. Wassef has lived in various metropolitan cities providing a unique exposure and understanding of diverse cultural backgrounds and religions. Dr. Wassef had his addiction psychiatry training from University of Pennsylvania. That allowed him to offer his patients the opportunity to try new and effective leading edge clinical care not limited to NeuroStar TMS treatment. I invite you to go through services we provide to learn more about our service and treatment approach. Dr. Wassef has over 15 years’ experience in general & addiction medicine and is certified by the American Board of Psychiatry and Neurology (ABPN) for Addiction and general psychiatry. He also has the distinction of being a Diplomate of the American Board of Psychiatry and Neurology. He served as medical director of several programs, including an acute inpatient psychiatry unit and medical detox unit at Christ Hospital, Jersey City. He is the acting chairman for the Psychiatry department at Christ Hospital, Jersey City. He is also the founding and medical director of Care First Medical Group, LLC. Dr. Wassef has lectured nationally on substance abuse treatment and pain management in chemically dependent patients, and has published several journal articles on substance abuse. As recently as May 2018, Dr. Wassef is internationally renowned in providing cutting edge NeuroStar TMS protocols to manage depression, anxiety, obsessive compulsive disorder, alcohol abuse, gambling, migraine headache, chronic pain, schizophrenia ( negative symptoms) and Bipolar depression phase.